[prMac.com] Limmared, Sweden - Independent developer FreneticGamez today is proud to announce the release and immediate availability of Epic Draw - Physics Puzzle 1.0, their physics-based puzzler for iPhone, iPad, iPod touch, Android, and Amazon Fire devices. 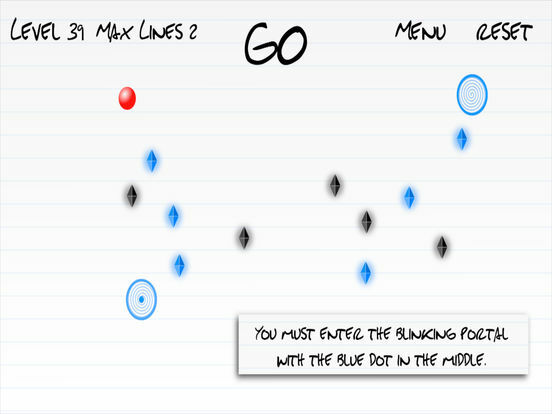 The game challenges players to complete each level by collecting all the blue jewels on the level by simply drawing a line for their ball to roll on. It's easy at first, but after a few levels, even the most strategic player will be challenged. Epic Draw is a game based on a simple concept. While the playing field is a stark looking place, the elegant gameplay more than makes up for it. 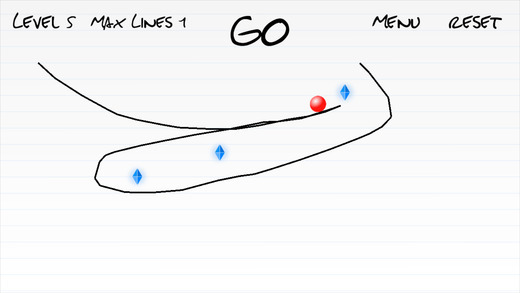 The player draws a simple line on the screen, which will act as a path for the on-screen ball to roll along, collecting all the jewels. The first few levels require only a small bit of strategy on the player's part, but once they make it through the first few levels, the challenge really begins. Later stages will require them think on more than one level. "I enjoy puzzle games, and find the challenge really keeps my mind sharp. However, it seems that many of today's puzzlers for iOS devices concentrate more on dazzling graphics and sound effects more than they do gameplay," says Mikael Johansson, developer of Epic Draw. "My idea was to strip a puzzle game down to its basic components, and concentrate on dazzling the player with the challenge of the gameplay, not the graphics." Epic Draw consists of 60 challenging levels. Gamers are faced with drawing multiple lines, dealing with portals, gravity switches, and more. They'll even be required to figure their way around the "No Lines Allowed" zones that they'll be faced with in some of the later stages of the game. Once players go as far as they can, they can challenge friends and family to try and beat their best by posting to Twitter and Facebook. Challenging others only adds to the fun. Everyone will enjoy this game, even while it slowly drives them crazy while they try and solve the devilish physics puzzles they are presented with. "I have always enjoyed creating physics-based games for all of the popular mobile devices," continues Mikael. "My previous game, Rubeum, challenged players to get their balls to the target as fast as they could. Epic Draw does not offer the same dazzling graphics that Rubeum did, but instead strips the physics puzzler down to its roots, offering a pure challenge that I know players of all ages will enjoy!" Epic Draw - Physics Puzzle 1.0 is free and is available worldwide through the App Store in the Games category. An Android version of the game is available through the Google Play Store. An Amazon Fire version is available via the Amazon Appstore. Headquartered in Limmared, Sweden, FreneticGamez is a one-man-strong game development firm, making games for iOS, Android, and Amazon Fire TV devices. All Material and Software (C) 2017 FreneticGamez. All Rights Reserved. Apple, the Apple logo, iPhone and iPod are registered trademarks of Apple Inc. in the U.S. and/or other countries.